Well-chosen images can educate, stimulate, or relax your clients and employees. Businesses communicate image and style through artwork, photographs, certificates, awards, reviews and articles. 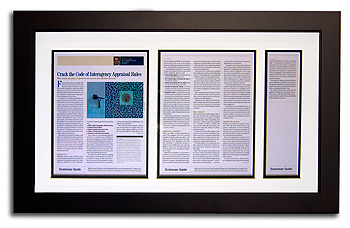 At FRAMECO, we work with you or your corporate designer to achieve the highest quality and consistency of framing that communicates your mission and enhances your place of business. We provide you with personalized consultations and exceptional craftsmanship. With hundreds of frames to choose from, you can be assured that you will find the perfect style to complement anything you want framed. You can feel confident that you and the items you frame receive the best quality care, materials and craftsmanship.